Do you find yourself missing some space on your phone? Would you like them to look better? 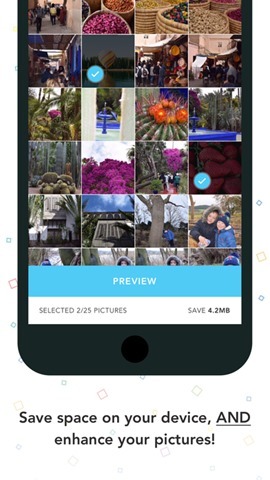 Magic Picture is a revolutionary way to enhance your photos and images, while reducing the space they take on your phone! Take up to 3 times more pictures, and make them look better with Magic Picture! Magic Picture™ can enhance any of your photos. This is not just a sharpening tool : through our proprietary technology we will bring out finer color, crisper backgrounds and amazing detail.